Aluminium Cremation Urns There are 3 products. The Cloud Urn is a very high quality solid cast aluminium cremation urn. 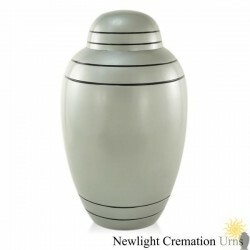 This funeral urn has a beautiful silver grey enamel body and lid with simple black bands. This urn is designed to be suitable for the ashes of an adult. 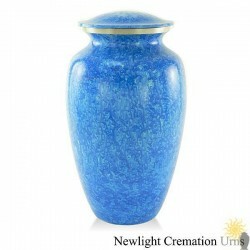 The Marbled Blue Urn is a very high quality solid cast aluminium cremation urn. This funeral urn has stunning blue enamel with beautiful darker blue marbling on the body and lid. This urn is designed to be suitable for the ashes of an adult. The Dog Rose Urn is a very high quality solid cast aluminium cremation urn. This funeral urn has a black enamelled body and lid with beautiful hand painted flowers and leaves. This urn is designed to be suitable for the ashes of an adult.